The performance of an application can be influenced by many components. Delivering the application to a user usually involves a rather complex chain consisting of many (weak) links. For instance a (virtual) desktop system that has to compete for resources, a WAN connection that experiences delay and jitter or a backend infrastructure that has to deliver content. Although these are all different causes they have the same effect. The user doesn’t want to know what the cause is, although it can help to understand and maybe accept, they only perceive a decrease in performance. Quantifying and grading the performance of an application as perceived by a user is challenging and requires guidelines and thresholds. In this webcast Ingmar shares research about the psychological effect of (variable) response times on the user experience and existing methods of grading performance. He will also explain a process to quantify and rate the perceived performance of an application based on the response time of an application. 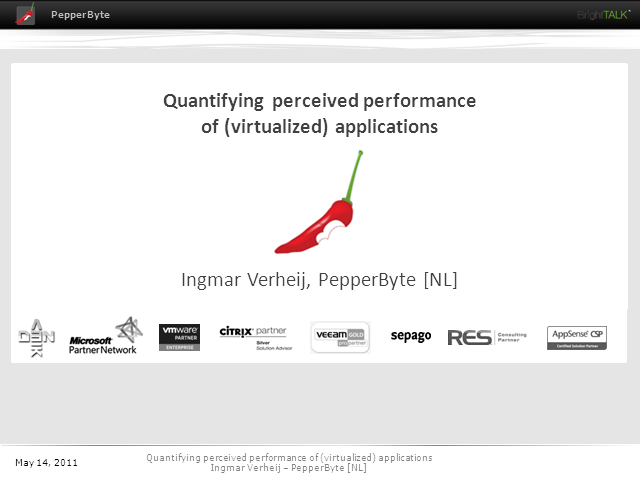 Ingmar Verheij is Senior Consultant at PepperByte, working mainly for enterprise and government companies. He started his IT career in 1996, and has at least 15 years of experience. Presently Ingmar focuses mostly on integrating and monitoring SBC environments. He holds a special interest in performance testing and integrating Windows infrastructures. Ingmar likes to share his knowledge and is a regular blogger on both his own blog and the PepperCrew blog.